If you do not see your case number listed just click on the blank case clamp below and in the order instruction box state the case number that you need the clamp for. If you also need a screw we have a order box below for Omega case clamp screws. We have no information by model name or date. Didn't See You Case Number? Order here and in the order instruction box just enter the Omega case number that you need a case clamp for. 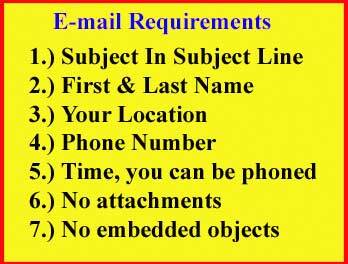 Just enter the Caliber Number and Case Number you need the case clamp screw for in the order instruction or comments box during checkout and we will take case of the rest. 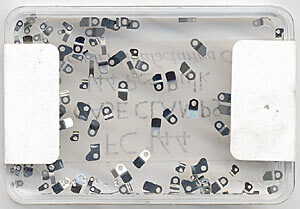 The FC144 case clamps assortment contains a lot of the same case clamps used in certain Omegas. A total of 100 pieces. 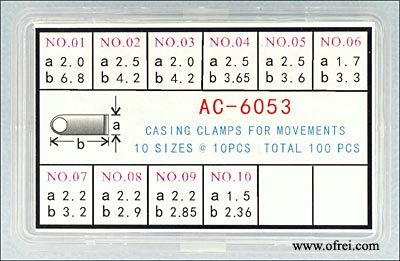 The case clamps assortment contains 10 pieces of each size (Width x Length): 2.0 x 6.8, 2.5 x 4.2, 2.0 x 4.2, 2.5 x 3.65, 2.5 x 3.6, 1.7 x 3.3, 2.2 x 3.2, 2.2 x 2.9, 2.2 x 2.85, 1.5 x 2.36 mm. . A total of 100 pieces. A list of some cases which use this screw: 395.0800, 595.0002. A list of some cases which use this screw: 195.0022, 198.0120, 196.0141, 198.0125, 198.0122, 398.0855, 398.0856 . A list of some cases which use this screw: 386.0822. Use in almost all clasps which use this part. A list of some bracelets which use this screw: DB1448/431, DE1448/431, ST1448/431, ST1449/432, DA1449/432, ST1451/439, DB1455/448, ST1455/448, TI1455/448, TB1455/448, ST1455/462, DB1455/462, DK1455/462, DM1455/462, DN1455/462, DR1455/462, TI1455/462, TB1455/462, ST1574/898, ST1489/813, DA1489/813, DG1489/813, ST1489/814, DA1489/814, DG1489/814, DP1489/814, DA1489/816, DA1500/820, ST1500/820, ST1501/523, DA1501/823, SP1501/823, ST1507/834, DE1507/834, ST1508/835, ST1509/836, ST1513/825, DA1525/855, ST1525/855, DB1550/860, ST1550/860, DB1551/861, DE1551/861, ST1551/861, DB1552/862, DE1552/862, ST1552/862, ST1560/852, ST1562/850, ST1563/850, ST1573/897, ST1575/899, ST6101/433, DA6101/433, ST6104/465, DB6104/465, DE6104/465, ST6104/469, DE6104/469, DB6104/469, ST6155/449, DB6155/449, TI6155/449, TB6155/449, DA6189/817, DG6189/817, DP6189/817, ST6201/821, DA6201/821, ST6202/822, DA6202/822, DA6203/856, ST6203/856, st6501/827, DA6501/827, ST6502/830, DA6502/830, DP6502/830, SP6502/830, DE6503/833, ST6503/833, ST6504/833, DE6504/838, ST6505/839, DB6551/863, DE6551/863, ST6551/863, DB6552/864, DE6552/864, ST6552/864, DB6553/865, DE6553/865, ST6553/865, ST6554/866, ST6562/874, ST6563/875, ST6573/912, ST6610/933, 6556/882. A 1.20 mm screwdriver is needed for this screw.